I love fudge its one of my favourite sweets, whether it be crumbly or the soft smooth and creamy variety, I love them all. Then of course you have all the flavoured fudges to choose from chocolate, cherry and chocolate, fruit and nut, the choices are endless. I've tried making fudge four or five times now, and on each occasion its been a fudging failure. You name it I've tried it - Easy Fudge Recipe the one that did not set. Super Easy Fudge Recipe a crumbly burnt concoction. Very Easy Fudge Recipe semi edible but just not fudge. Even the Easy Peasy Fool Proof Chocolate Fudge Recipe another disaster. I don't know which of the fudge making skills evade me. Could it be I'm using the wrong type of saucepan, well after all a bad workman blames their tools. Maybe the heat is too hot or what about a failure to stir rapidly enough or maybe even the simple fact that I'm just inept! A lesser person would let this constant failure defeat them, but not me this is now a challenge and failure is simply not an option. One day I will make fudge. One day it will be edible. One day it will be amazing. That one day may be far far away or maybe that one day will be one day soon. Sadly it will not be today, this time around I attempted Cherry and Vanilla Fudge, a recipe using up some left over condensed milk. It kinda looks like fudge, but the consistency is far from fudge, more of a cross between toffee and fudge, toffudge even! Whilst it did not taste like fudge it was still very sweet and edible. 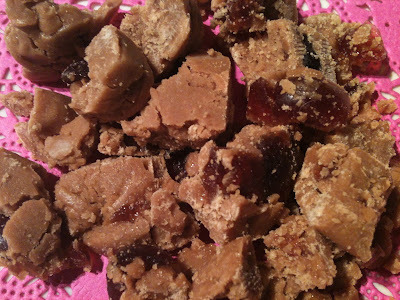 Do you have any tips for making perfect fudge, please feel free to share them with me all help gratefully received. The only other piece of advice I can think of is the slower you bring your butter and (melted)sugar to the boil, the better. Thanks Jo for the tip about bringing to the boil slowly, will bare this in mind the next time I tackle fudge. I'm sorry that your fudge recipes didn't turn out quite like you wanted them to. My tips to you would be to follow the instructions exactly as listed. Many will tell you how long to cook and stir for each step. Also, if you're having problems with burning, use recipes that require the use of a candy thermometer. It may help you out. Good luck with your fudge making! On this sunny, springlike day I discovered your blog with its delightful title! It's so nice to 'meet' you! Fudge! I have a recipe which, if you respect the boiling point is foolproof. I never thought I would manage to make fudge so well! I will be back to read your adventures. Thank you so much for the lovely comments. It was not such a nice Spring day here you were obviously having nicer weather in France. That is too bad about the fudge, it looks yummy though :) I am sorry I won't be much use with any advice, as I have never attempted to make it myself. I have no advice to offer as I have had similar failure's with fudge. I do remember trying one recipe that you weren't supposed to stir at all as this caused it to go grainy? Have you tried Nigella's Chocolate and Pistachio Fudge? Google it, and there's loads of foolproof versions available. I added dried cranberries and it's fabulous! Thanks for the tip Yvonne, I love Chocolate and Pistachio's so sounds like a winner to me!